Last One Out was presented as an audio-visual event in 1989 at: The Free International University, The Brick Lane Cellar, Sheffield Arts Festival, ICA London and The Richard Demarco Gallery Edinburgh. It was a performance of sounds and spoken words with occasional visual interaction presented to an audience seated in darkness. This record which is a document of the event might also be listened to in this way. Track 1 composed entirely from natural sound sources; Track 2 with the voice of Eve Libertine. B side: 'Nothing does not exist'. ... 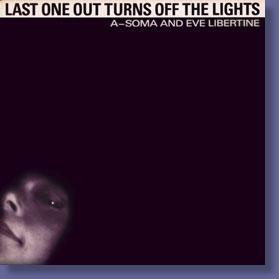 Speaking of raw originality, A-Soma and Eve Libertine have made a record which is definitely for people with open minds only. If you didn't like 'Acts of Love' stop there because this takes it five stages further. It is a two-sided disc with very different styles on each side. The first is a collection of un-sampled natural sounds. It is a rainbow collage of audible colour. No words just pure emotion and imagination. It is very relaxing. A feast for the ears that will fool the eyes. The second side is spoken words by Eve, mostly, that seem to echo and bounce from the innards of my skull. Simple ideas are intersected with bits of poetry and complex thoughts. It is refreshing to be challenged and expanded by sheer understanding. Not for the weak at mind! A very strange and surreal experience this, from a most inventive duo. The 24 minute 'A Miscellany Of Displacements' is a carefully crafted soundscape composed of familiar and indescribable sounds, an oozing flowing array of sound colours, noises and restless atmospherics. Contrastingly, 'Taking Care Of An Unconscious Patient' is an excursion for the many voices of Eve, a patchwork array of observations, ludicrous statements, quotes, examinations. A strange and humorous experience, it holds the attention throughout its near 24 minute duration. A-Soma uses the associative meanings which sound so readily evokes. Vocalised emulations of emotional tones of speech form an ongoing series of ironically poetic incidents into a pattern which itself becomes an exploration of language and the structure of its sound. Eve Libertine's lone voice relays this via the adoption and modulations of quotations which inform other quotations in both inflection and prose. You won't find any music here, just a baffling assortment of mother nature's own sounds, ranging from on the spot recordings in abandoned railway tunnels to windless mountain top compositions. It does work best in darker surroundings, hence the title, and I heartily advise applying yourself to it when you're snug between the sheets. For instance side 2's three-headed Eve Libertine (her first collaboration since Crass) mounts such a barrage of perplexing questions, answers and statements that on first hearing it kept a devoted dream transcriber like me occupied for hours the following morning. An ambitious project which deserves your support, but a taste for the unusual is essential! Strange one. Eve Libertines first work since being involved with Crass. It uses a lot of treated voices. On the verge of being an experimental Radio Play. It uses multilayered voices and 'natural sounds' recorded in various locations with natural reverb such as a mile long railway tunnel. Huge chunks of of spoken text sliding across each other. If that's for you then this is for you.